The JCoSS Cross Country team performed exceptionally well when they travelled to Queen Elizabeth Girls School for the annual district competition. The conditions were atrocious with the snow, wind and mud making the course a real test for even the hardiest of runners. The JCoSS team did us proud with each pupil finishing in the top half of each race; an achievement glorified by the fact each race contained over 80 participants. There was standout performances from Sophia Godfrey in the U13 girls race where she managed to finish 1st by well over 300m. Danny and Oliver Miracco finished strongly to gain 2nd and 3rd position in the U15 boys race, whilst Aidan Raphael put in a dogged performance by coming 11th. 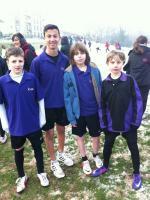 These four pupils now qualify to represent the District at the Middlesex Championships in a few weeks. If they are successful there then they will go on to represent Middlesex at the English Championships.